At work I spend a fair amount of time talking to journalists and Heather Brooke is often mentioned as pioneering and inspirational in her quest for truth. You may know her as the one who campaigned tirelessly to expose the scandal around MPs' expenses. It must have been difficult for her to stomach The Daily Telegraph buying the evidence on a disk to expose the abuse of the system. MPs expenses get a mention in the book, but there's so much more. 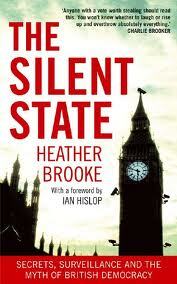 The Silent State is Brooke's diatribe against the lack of transparency in the British state. She takes us through numerous examples of how our much-celebrated democracy and sense of fair play is, in fact, a myth. Chapter by chapter, my long-held view was undermined that we have a shining example of openness in politics and society. From the amount of money that's spent on PR and spin for government departments, the civil service and Quangos; to the use and abuse of research and statistics to justify policy. Brooke rails at the system and blows open the flaws, so often avoided in the press, of our political system. The complete lack of accountability for civil servants - and their ability to destroy lives - makes for a particularly uncomfortable read. Brooke pricks the reader's conscience by exposing how we are all culpable to a greater or lesser extent. I felt this acutely as she railed against ConstructionSkills, the industry body that receives government subsidy to promote training and skills, as it searched for a PR agency to promote what a good job it does (I work for Skillset, the equivalent body for the creative media industries). It also rang true when confronted with the publishing industry (I've spent 15+ years working in) that takes government (and therefore our data) to package and sell back to, yes, you guessed it, us. There are too many examples to mention: each would make a pretty decent expose in themselves. The book isn't perfect. Her tone and style may grate. You may feel that you are being shouted at. Brooke originally comes from the US and trained as a journalist there. Her views are clearly influenced by this and may not be to everyone's taste. But you can't deny there is some truth in what she is saying: our democracy is not what it seems. We need to wake up and challenge this. It's our democratic right.